Click right here to go to the newest post. In January 2019 it “hit me” that January 2020 would mark the fiftieth anniversary of my surrender to God through Jesus Christ. So I thought it would be a great idea to start posting week by week on Facebook my course in my young life before I came to Christ, then somehow have an “Internet celebration” on after my fiftieth anniversary. As you might know, after weeks and months the posts of a person active on Facebook will get buried by new posts. So I thought it best to archive them on at least one of my sites. My Oasis Of Hope seemed to be a great place for it. We begin with the oldest, which I posted on January 31, 2019. Anyone trying to learn English by reading these posts, they were written in what might be called, “freestyle” or “casual American English”. Grammatical rules are not followed at times. Also, keep in mind I purposely do not capitalize “satan” unless it begins a sentence. Throwback Thursday Countdown To The Week Christ Saved Me - Week 51: As I start this countdown to the 50th anniversary of when God in His mercy translated me from darkness into the Kingdom of His dear Son, I ought to give the background. My Dad was Russian Orthodox, and Mom was Roman Catholic. Back then (and I think it is still the case now) in such a union the Roman Catholic Church (RCC) insisted that the non-Roman Catholic of such a union had to agree that their children would be raised RCC. And so it was for my sister and I. Neither the RCC, Russian Orthodox, or any (and I do mean any) religious group can save a person from the wrath of God, Hell, their sin, and their sin nature. Only a direct connection with God through Jesus Christ can anyone be saved (John 14:6). So, like the overwhelming majority of the population of the world, all four of us were unregenerated sinners. And, like for some if not many, there was a mixture of good times and bad times. Personally, going back 50 years from this week I would say things were mostly bad, yet, God in His mercy was working in various ways and through various branches of the Body of Christ. As I countdown to Week 0, the last week of being unsaved, you will read a lot of negative things in my TBT posts. I am whining and I SURE DO NOT WANT SYMPATHY. I do want to bring out the magnitude of two things, viz., the magnitude of sin with its devastation but also THE MAGNITUDE OF THE GLORIOUS MERCY OF GOD. I desire any Christian reading this to be involved with evangelism, spreading the Gospel. Someone may be suicidal, even a child. That husband and wife you know who are constantly fighting each other can be redeemed and brought into the realm of Christ where they live together in love and forgiveness. And more. In the next few posts there will be some more background after which I want to fast forward to 1969. God bless! Throwback Thursday Countdown To The Week Christ Saved Me - Week 50: More background before I dip into 1969. Gotta go back to the later 50s, early 60s. Catechism was part of the curriculum at Saint Stephens School, Kearny, NJ. I did pretty well in that. I can still remember confirmation day. We were assembled in St. Stephens Church. THE Bishop was there. He asked us questions based on our catechism training. There was a bunch of us. Most everyone raised their hands on every question he asked. He would point and select a child. For some reason I was selected three times, and gave the correct three times. I was good Roman Catholic boy – for that time. However, one spring day we were assembled in the school yard to pray, and I guess sing, to Mary. I believe the girls were to crown her statue with flowers. At some point we were about to pray the Hail Mary. It was then I felt God say to me, “PRAY TO NO ONE BUT ME.” Uh! Um? So while most, if not all, were praying the Hail Mary, I prayed the Our Father. I figured that was safe. That was good. But something else came along. There was the Biafran crisis. The TV kept showing pictures of African children in a state of extreme starvation – stomachs swollen. Then, one Sunday in church the priest announced they would like to place a gold arch over the altar area and were seeking donations for it. What!? What about those African children? I developed an anger over that, then a hatred for the RCC, which grew into a hatred for all religions – but, oddly enough and as satan would have it – ESPECIALLY FOR CHRISTIANITY. I had to add that to my countdown because it was this hatred of religion that to some degree hindered me from receiving Christ as Savior and King, and become part of true Christianity. That was the big struggle in the four to five weeks before I came to Christ. Despite this, God was at work, helping me to align my mind so I might repent and surrender to Him. Throwback Thursday Countdown To The Week Christ Saved Me - Week 49: Right now in 2019 it is Valentines Day, and so the perfect time to bring up my parents' relationship with each other BEFORE they came to Christ. It was shaky and scary, very shaky and very scary. Heated, heavy, highly vulgar arguments would occur from time to time. I still remember one wintry or fall time coming back to Kearny after visiting relatives in Jersey City. We were on a highway that was underneath another highway (almost like a tunnel). Dad was driving, Mom was the front seat passenger, and I was on the back seat. I do not know what the problem was, but they were very vehement towards each other. I thought one might kill the other. I started crying, wrote “help” on a steamed up window, laid down, cried more and shook. Probably no one but God saw the word “help” and little did I know my parents would receive His help over a decade later. They slept apart. Dad had his bed, Mom had hers. One day my dad had either pneumonia or a very bad cold, did not go to work, and stayed in bed, coughing, etc. I was in bed. After a time I heard my Mom tell my Dad that when he got better he was going to fix certain things and then she was going to divorce him! Divorce! That was worst than hearing their vehement vulgarity. That cut right into my heart! For months and years I worried about that. Would this be the week? Are my parents going to split? Thank God it never happened. However, one day I came home from school and my Mom took my sister and I – I guess she said WE had to go somewhere. Unknown to me at the time – or maybe I did hear at that time and forgot I heard – Mom had been in the basement arguing with my Dad when Dad took a sickle, held it to his throat, and said, “One of these days Mae ...”, and made a slit noise while moving the sickle past his throat. So Mom figured he indicated he would kill her. So we fled the house while Dad was on second shift. First stop was the Kearny Salvation Army for counseling for my Mom, then a friend's house where another fleeing mom was. A phone call came in from her husband and the lady of the house lied and said his wife was not there. But something made us children to yell, “We're here!”. But the lady of the house hung up and said to us he did not here you. From there my Mom fled to Jersey City, placed my sister somewhere and placed me with my aunt Anna (whom I would call Ancha-banana). Unknown to me, my Mom checked into the hospital across the street for a nervous breakdown. She would be there for about two weeks. Saint Stephens somehow sent school work to me. It was there my cousin snapped my neck to the right – after I aggravated him. That is why my head leans right. Again, let me repeat: I am not whining or complaining. I want no sympathy. It is designed so I have sympathy. This is stuff that leads up to my conversion to Christ and this particular scenario no doubt is a factor in an aspect of my ministry: proclaiming hope and healing for any marriage through Jesus Christ. If you need some help please see my marriage pages at https://oasisofhope.neocities.org/ma00.html . Dad found out where Mom was at and we went back to Kearny. It remained shaky and scary, though somewhat subdued. A godly change would occur in 1970. A few more posts like these and I will head to 1969, my last year being without Christ. Throwback Thursday Countdown To The Week Christ Saved Me - Week 48: Adults often like to ask children “What do you want to be when you grow up?” My reply starting from grade school times would be “a scientist!”. The 1950s bristled with interesting people like Dr. Jonas Salk, Alexander Flemming (and others), and Albert Einstein. Like millions of others I was the recipient of polio vaccine (Salk). A little later, penicillin got acquainted with me after bouts with scarlet fever and scarlatina. I forget which one it was but I was strictly told by a doctor I could do nothing for two weeks. Was not even allowed to walk around. Dad had to carry me upstairs to bed. And, of course, Albert Einstein was very impressionable, even after his death. So I thought science had ALL the answers! I was so much of a science hound, in the earlier days I hates sports and could not care less about keeping up with the names of the makes and models of cars (and, lol, I still don't). The government and some businesses were encouraging youth to get into the sciences. The Cold War was on. And in 1957 it seemed to me that the adults around me and on the radio were shocked and concerned about the Russian Sputnik 1 – the first man-made satellite to circle the earth. It would not take Russia long to develop long range nuclear weapons (the soon development of IBMs made CONELRAD obsolete https://en.wikipedia.org/wiki/CONELRAD ). Despite the scariness of all of this, when my grand parents got a pet German Shepherd I named it Sputnik. Eventually I was asked if I could be more specific as to what type of scientist I wanted to be. Given the various colors of liquid I would see in mysterious looking flasks and test tubes in pictures and advertisements I settled on being a chemist. Throwback Thursday Countdown To The Week Christ Saved Me - Week 47 (learn about Uncle 1 = my invitation to the occult): As mentioned last week, I took a great liking to chemistry. My Dad made a space for me in the basement for my very own little lab. Over the course of time I saved up enough money to buy a $20 thistle tube to add to my equipment. That thistle tube looked great in my lab until I tried an experiment that would produce hydrogen gas. I can't remember if I was using one flask or two. Either way I was to see some type action. I was using the that wonderful thistle tube for some reason. As I added substance “A” through the thistle tube to substance “B” I noticed there was a reaction but no indicator of release of pressure. Hydrogen gas was accumulating in the flask, but there was no flow out of the flask. No flow = it might blow. It might blow! I ran up the steps hollering “It's going to blow!”, frightening my parents. The moment I got to the first flow I heard POP, SMASH! No explosion but the pressure blew the thistle tube up to the basement ceiling and smashed my $20 thistle tube to bits. I liked other sciences too: geology (had a rock collection), meteorology, electronics (got kits), etc. During our trips to and from Jersey City we would often go by the AM transmitter sites along NJ Rt.7: WOR, WNEW, WMCA. I sure would have liked to work in radio (and I did after over a decade from coming to Christ). To add to my intellectual scientific realm I had an uncle, whom I will call Uncle 1, who was very bright. One of the places he worked for was Honeywell. Anyhow, he was very knowledgeable in the sciences. I would ask him loads of scientific questions when he would visit. I would bounce my theories off of him and he ably explained why a lot of them would not work. He was scientifically smart, but not spiritually smart. He was the uncle that introduced me to the occult. I / we started to get a subscription to an occult magazine. I started to mess with Ouija boards, palm reading, tea leaf reading, Tarot cards, astrology and more. I almost went way too far, especially one night – but that will be saved for another TBT countdown. I need to explain why it was the grace of God I was a junior in high school 50 years ago. I might have been a grade or two behind (the educational system did not play around back then). Throwback Thursday Countdown To The Week Christ Saved Me - Week 46: Fifty years ago I was a junior in high school, but only by the grace of God. As you might recall from the previous posts about 60 years ago I aspired to be a research chemist. Up until the fifth grade my academic grades indicated I had the capability to reach that goal. The only blight was on the backside of the report card issued by St. Stephens School. "Emotional Stability" was often marked at the highest with an "I", meaning "improvement needed". The vehement relationship between my Mom and Dad was partly the cause of that. Christ would take care of that situation at the end of 1970. Those high hopes were dashed one day. I had been going to a place where my parents told me not to go and began breaking the law. Then one day I was arrested by a juvenile detective. I WAS SUNK! The detective told me I had to lead him to my correct address. I told him. We get to my block and to my dismay there was no parking space anywhere near my house. So the detective had to park at one end of the street. That meant we had to walk down about half the block -- right past any neighbors who might be out or be looking through a window -- and they would see this detective holding my arm in a special grip so I would not run from him. EMBARASSING! My head hung low. We ascend the front door steps to my house. "Mom, Dad, this is detective ----- ", and I ran upstairs to my bedroom, shut the door, and bitterly cried. Being arrested was one thing. Disappointing my parents, whom I loved, was unbearable. I did not want to come out. No. Not because I thought they would punish me further, but because I could not bear to look them in the face -- I had disappointed them. Though the officer laid restrictions on me, I punished myself. For about a year I felt I could not eat any meal with my family (my sister was still there at that time). I was too ashamed. My shame and my guilt were unbearable. I actually wanted to die -- and I was not even a teenager yet. But God had a plan. Remember, I do not write this stuff for sympathy, but as an outreach to others that might be hurting. More next week, but consider what is currently happening. Child abusers are being exposed. Secret murders are being revealed, etc. It sounds horrible, but I would say it is the mercy of God. For example, if that detective did not arrest me I might be in horrible shape today -- if I was not killed instead. So, pray for those that are being exposed that they might surrender to God through Christ. It is far far better to be exposed now, repent now, become born again now, than to die in sin and then resurrected to eternal condemnation. Throwback Thursday Countdown To The Week Christ Saved Me - Week 45: First, for those who want to know what all of this is about, all of these posts can now be easily found at https://oasisofhope.neocities.org/TBT.html . Second, you are about to read what I consider the darkest time of my life. I am not looking for sympathy, but doing this in part to reach out to others who may be deeply hurting and point them to the Savior Who can straighten up anyone. Yep, anyone! Last time you read about my first arrest. I was deeply hurt because I felt I had disappointed my parents. For about a year I punished myself, refusing to eat with the family, – ate in the parlor watching TV. Quite often when we sin the devil seems to enjoy taking things further – into ungodly guilt, mental torment and depression. I thought just about everyone knew what I did wrong. I felt I was the fool of the earth. I considered my appearance ugly and thought there was a growth from the top of my head almost covering my eyes and everyone could see it and knew I was THE FOOL of the earth. Oddly enough, the song, Fool On The Hill came out about that time (and I forgot to mention “My Little Runaway” came out around the time my Mom took us and ran away from Dad). Though Wikipedia credits The Fool On The Hill to the Beatles, the rendition that ran through my mind was the Sérgio Mendes & Brasil '66 version. Nonetheless, I was in torment – were they singing about me? A dismal hopeless doom prevailed in my mind. Some of the music of the times and the growing drug culture did not help. Crimson And Clover was one of the songs. I did not take any illegal drugs, but it seemed I WAS being mentally drugged. I felt ashamed, a failure, and worthless. I hated myself. Attached (hopefully) is a picture I did NOT want to be in at that time. But Mom insisted I get a picture taken with the neighbor girl. Perhaps she was trying to snap me out of things. I now think it happened – planned by God – so I can present it in this post. I am sure my sister and her husband or husband to be (cannot remember when they got married) knew what I did and certainly saw how emotionally low I was. About two or three weeks after my arrest it was insisted I go with them to the movies to see … Mary Poppins. I did not want to go. I kept my eyes shut in theater, but peaked every now and then. I remember peeking at one point and seeing the boys in the pic, and they sort of reminded me of the boys that informed the detective. Now, I praise God for two things: 1.) psychiatry was not all that developed back then and 2.) psychiatry meds were not all that prevalent back then. I am sure my loving parents would in all well meaning would get me some “help”. Looking at what some people do today for mental anguish I am so glad that never happened. My grades “took a nose dive”. I almost failed 6th grade. But the providence of God saw to it certain things were done and said in order delay any suicide attempts. And there was one thing in particular that was a factor for me to eventually make peace with God through Christ a few years later. God willing I will post some of those things next time. However, if you are a Christian, be very attentive for any nudge of the Holy Spirit to pray for someone. If you are going through a dark time yourself, Christ desires to help you. You are NOT worthless. If you do not know God through Christ, if you have not been born again, please turn to Him now. Throwback Thursday Countdown To The Week Christ Saved Me - Week 44: Last week's post was very dismal but I cannot put into words how horrible I felt. However, I said God soon did certain things that eventually led me to Him. I will mention two in this post plus something my sister said that lessened my suicidal tendencies. But first, one more negative thing I forgot to mention: I had stopped taking piano lessons. When I was younger one day my family went to a wedding reception (I guess that is what it was). Not sure if I was four, five, or six – young enough to do something weird like pick up cigarette butts off of the floor, put them in my pocket, go to a backroom and put them in the trash. Hey, I was trying to help. lol! However, I think it was at that time I met an upright piano with keyboard opened. Just what do you think a little boy might do? Yes, I hit one of the notes, and it was a deep base note, and I thought it was fantastic. 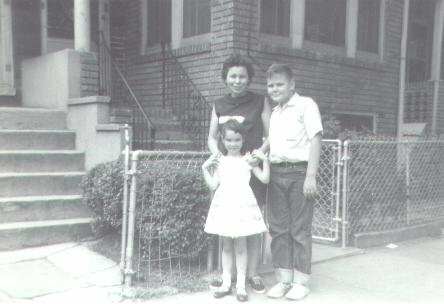 So, when my parents asked what instrument I would like to play I said “piano!” So I had around five years of lessons from a Mrs. Maybee on Sealy Avenue in Kearny. God enabled me to memorize musical pieces and I was in a number of competitions for memory and performances. Mrs. Maybee taught me how to compose. However, after my first arrest I was not practicing the piano very well. I decided to quit taking lessons. I am not sure if the expectation of my teacher for me to play a duet with a young girl had anything to do with it or not. Instead, I began taking martial arts. That hardly lasted two years. And my piano skills rusted and lay dormant until some years after I came to Christ. Now, turn around point number one, and probably one that would explain why 50 years ago in early 1969 I was actually high school junior and had not fallen behind by a grade. Remember, the education system play around back then. If you failed a grade YOU FAILED A GRADE and if you could not make up for it during the summer you did not progress to the next grade. Well, I think it was 6th grade that I almost failed. So, as I continued to poorly perform in seventh grade, they transferred me from 7A to 7B. 7B! Horrible! The “B” groups were (in my mind back then) for the bummers, the dopers, slouchers, scummers and the losers! I hated every moment I was in the “B” group. And that was the best thing Saint Stephens School could have done for me. I was determined I WAS NOT going to stay in that “B” group. So I worked hard to get my grades up. They did come up. I was transferred back to the “A” group. However, my grades never went back up to where they were in grades one through five, and remained average of just under average. Now, I do not remember if it was about that time or later, but my sister said something to me one day that lessened my suicidal tendencies and gave me hope for at least a tiny pit of brightness. I am posting this to encourage others to say something positive – and not negative – to those who depressed or even suicidal. As you recall from the previous posts, after my first arrest I had very low self esteem. When I looked into a mirror I saw a fool, a loser, a failure. But, one day when we were over at my sister's house my sister Pat said to me, “When you get older you will be handsome looking.” Alright, stop laughing folks. But that is what she said and after that my suicidal thoughts lessened. A third turning point was truly a godsend. My parents did not take me to psychiatrist nor was I ever given medication. But my parents did give me something that turned out to be one of the ways God reached me. God willing you will read about that next week. Throwback Thursday Countdown To The Week Christ Saved Me - Week 43: 50 years ago I was in the second half of my junior year in high school – but only by the grace of God. I had just about failed a middle school grade but God saw to it that I was determined enough to improve after being put into what I would call a bummer class. Also, despite my suicidal tendencies I was still alive, partly due to what my sister had said. However, passing from grade to the next and deciding to live does not get anyone into heaven. Like everyone else, I had to repent, and make Christ King and Savior in my life. As I said, I was in great anguish for being arrested and disappointing my parents. The required probational visits to the police station were mentally unbearable for me. I would eat bits of plastic, hoping I'd get sick and would have to go the hospital instead. My parents saw my torment, and once again I thank God no psychiatric medicine was given to me. But they did give me something that got my mind off of me from time to time. The day came when they gave me a multi-band radio, having longwave, shortwave, and 6 meters (around 50mHz) bands. I was able to tune into all sorts of radio stations all over the world! At my finger tips were ships, international broadcasts, radio-teletype, amateur radio, time signal stations, all sorts of stations including SPY operations! I took on the hobby of DXing / shortwave listening. DXing is the short way to say distance listening. I used other radios like stand broadcast band radios for the hobby too. Attached to this post (to the right just) is a picture of the multi-band receiver my parents gave me, a Lafayette HA225 receiver. Now, keep in mind this was the 1960s, we were fighting in Vietnam and the Cold War was on. Until I got headphones, the sound was turned up mighty loud. Looking back I have to wonder what my neighbors thought when I listened to Radio Moscow and Havana Cuba! Part of the hobby was to collect QSL cards, or some type of verification, from stations you heard. Sometimes you had to pay return postage through international reply coupons. Some of the QSL cards I collected were from Moscow, Australia, Afghanistan, Ghana, Ecuador, Japan, Taiwan, Canada, Fort Collins Colorado (time signal station WWV), Hawaii (time signal station WWVH). Some stations like the one in Bulgaria would send not only a QSL, but information on their culture. Taiwan also sent a decal. Attached to the right is a picture of some later QSL cards in my possession. Top to bottom, first column is Netherlands, Hawaii, South Africa; center column Bulgaria, Taiwan; column on your right Ukraine (I think), and Australia. Most stations had interval signals that identified them before their scheduled broadcast. Australia had “Waltzing Matilda”. I had always hoped to get cards from remote places and islands. I found islands amusing, and that, coupled with my hobby, opened the door of my mind to begin to understand the mercy of God and His desire to bring each of us into His kingdom. One day I tuned in just the right island. More next time. Throwback Thursday Countdown To The Week Christ Saved Me - Week 42: As you read last week, in order to snap me out of my deep depression my parents did not take me to a psychiatrist and get medication for me, but they gave me a multi-band radio to encourage me to get further into the hobby of DXing (distance listening). Little did they or I know that it would be a tool for God to eventually get my life right with Him through Christ. Also, I mentioned that as a young boy I considered islands to be fascinating. I got into DXing big time, even staying up at night when the “skip” (propagation of radio signals) was better. I sent out reception reports and began collecting QSL (verification) cards and letters. My main antenna was a windom antenna, a wire stretching east to west in our back yard, tapped at 1/3 of its length. It was especially tuned to the 31 meter band (approx. 9.5mHz to 10mHz). My Lafayette HA225 receiver had an antenna tuner so I could adjust for reception on other frequencies. I had always hoped to find remote stations, especially those on islands. However, any island was fascinating. One set of islands, the Netherlands Antilles, had a station at Bonaire, operated by Trans World Radio (TWR). I tuned it in one day. Yes, the Caribbean is not all that “remote”, and TWR at Bonaire was not a rare catch by any stretch of the imagination, but it was a station on an island and I wanted a QSL. The trouble was, it was a religious station! BLEAH! Those were the days I was often in a “hate God” frame of mind. I hated God and showed it by never capitalizing God, unless it was for school work or the family would see. Well, it was an island and I wanted a QSL from an island. So I monitored a TWR broadcast from Bonaire, taking notes for a reception report. Back then, most of us DXers would use the SINPO code for reception reports: S = Signal Strength; I = Interference (from other stations); N = Natural disturbance (cloud static); P = Propagation (any fading in and out of signal strength); O = overall rating. The reception report had to include the time the station was heard from start to finish in UTC (GMT), date, and frequency. But, to really prove you heard it, you had to provide some program details. Well, in pain I listened to the Gospel, getting angry every now and then. I was not very nice in describing the program, probably writing, “then the male speaker talked more about the Jesus trash”, “there was a stupid religious song”, “a female announcer talked about phoney salvation crap”, etc. etc. I think I even used worse than that! Now, today as a minister I remember how I was before I came to Christ – very nasty toward the Gospel, and so when I come across people like that I know there is still hope, and I smile. Anyhow, I sent the reception report – as nasty and perhaps vulgar as it was. Would I get a QSL? I did, but more. See next time what else TWR sent. Throwback Thursday Countdown To The Week Christ Saved Me - Week 41: As you recall, I was in a “hate God and all religion” frame of mind when I wrote my reception report for Trans World Radio – probably punctuating it with vulgarity here and there. 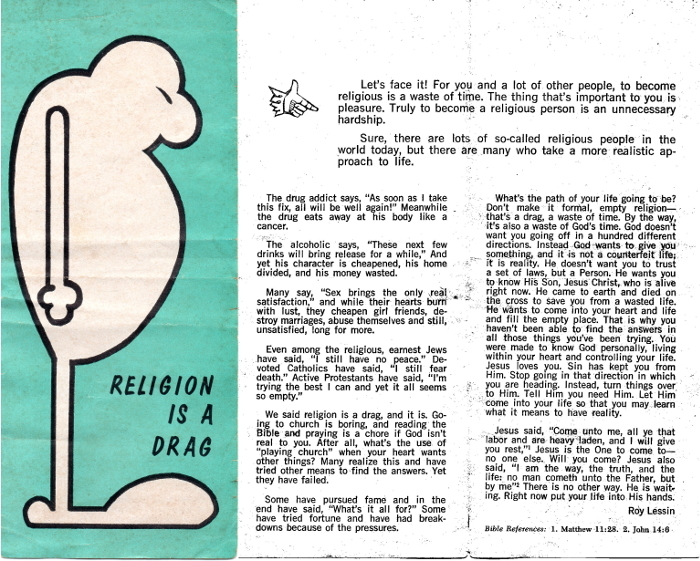 Nonetheless, they did send me a QSL card, but also a Gospel tract called Religion Is A Drag. An image of a copy of it appears with this post and is a scan of a tract that Kearny Assembly Of God had. The actual tract is probably in a folder somewhere with other tracts that I was using in a teaching at the church we currently pastor. I remember thinking, “Yeah, that is right” when I saw the title. So I decided to see what the tract had to say. As I read it, my mind considered the possibility that religion is one and God another. They could, and perhaps should, be distinguished from each other. Well, I was still angry, but I did not tear up the tract. So, into my desk drawer it went. My dxing (distance listening) hobby was enjoyable and often diverted me from gloom. My grades improved slightly, so much so, however, that I could stay in those “A” groups. And, in 8th grade the day would come I and others would have to meet with Kearny High School (KHS) staff to map out our four years there. I was still Roman Catholic in name, but I really hated religion and God – if there was a God. So, instead of opting to go to Queen of Peace, I decided to go to the local public high school. It would save my parents money anyway. However, I was in for a bit of trouble when when I met the KHS staff. Hear about that next week, God willing. If you need to catch up on these posts they all can easily be found at https://oasisofhope.neocities.org/TBT.html . Though I had been in a state of deep depression, my parents helped to snap me out of it by getting me into the hobby of distance radio listening. Though I almost failed 6th grade, my grades started to climb back up. When eighth grade arrived it was time to make some decisions as to what high school to attend and what course to take. As you have read, I had enough of religion and God, so no Catholic high school for me (although for some odd reason I went to “Christian” confraternity class for one year). So, it was Kearny High School (KHS) for me. Then came the day some of the KHS staff came to St. Stephen's school to interview the students who wanted to attended and have them select a course and other items. Because I still wanted to be a chemist I wanted the college prep course and because of my Russian ancestry I wanted a class in Russian as my language class. My turn to be interviewed came. When I said I wanted college prep the counselor tried to talk me out of it. I do not remember if I insisted with tears or anger or both, but I sure did insist. They finally said “okay”. Then they asked what language did I want to learn. I said Russian. This time THEY were adamant! No! They said Spanish or French. I hated French so I said Spanish. Down the table from me was a female student. She was in tears. For some reason I think she wanted college prep too, but they would not allow her. Since I mentioned “Christian” Confraternity Class I think I am being prompted by God to write about that, and at least two lesson I feel God wanted me to learn – one of which he used a guy called “David Dulanery” to teach me. Find all previous posts at https://oasisofhope.neocities.org/TBT.html . Godly Self-Esteem | The Forgiveness Factor | Be Ready! ©2019 Peter Macinta, you may copy, store, redistribute, UNCHANGED in content and not for sale.